The Galleries of Granbury include Artefactz, Langdon Center Art Gallery, Shanley House Art Gallery, Against the Grain Studio and Your Private Collection Art Gallery. They are all located around the Historic Granbury Square, and are filled with the art of local, regional and national artists. Most are open daily and their hours as well as events are provided on their individual listings. 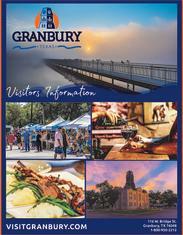 The Galleries of Granbury&apos;s Facebook page also shares events and activities. You don’t want to miss the exceptional art on exhibit during your visit to Granbury!